About She's Fit To Lead - She's Fit To Lead is a media property that is devoted to inspiring college age women to become confident real world leaders. With a robust following on our website and social media and a successful track record of live events, we have a reputation for being the "go to" place for smart content, solid advice and in depth features on inspirational women (of all ages and career stages) and their accomplishments. 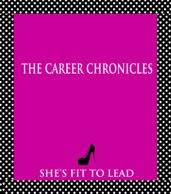 The Career Chronicles - The Career Chronicles exposes the real truth about the real world. Through extensive interviews with women just starting their real world journeys, we answer the questions that are pressing to so many. What is it really like to be a financial analyst, a social worker, a teacher, a management consultant or even a rocket scientist? How do you know if grad school is really for you? What should you wear to your interview, and if you get the job, what will you have to wear every day? First Edition Status - The first edition of The Career Chronicles was published as an ebook on December 5, 2016. https://www.amazon.com/dp/B01MSVUMN7. The entire book is a millennial woman creation. The cover image was designed by a young aspiring artist. The book was written, edited and the looks styled by three members of the She's Fit To Lead team, each a college or graduate student. The looks draw primarily upon clothing from Of Mercer, a brand founded by two Wharton MBAs (who met the first day of business school because they were wearing the same dress), Latico by Liv, a handbag line developed by a U Wisconsin sophomore and Beaded by Marley, a jewelry line designed by a U Wisconsin junior. Potential Brand Extension - The Career Chronicles brand will be expanded in a number of ways. The future edition's interviews will focus in on specific industries. These interviews will be done in collaboration with companies who will include links to their career websites or other promotional information. The content will be extended to feature other elements of "real world" life like health, beauty and fitness advice, which is an additional branding opportunity. Finally, the "looks" featured will be sponsored by major retailers who will be able to be involved in content creation from the early stages.